It's been a little over a year and a half since I quit my band directing job, and I have to admit that it feels like it was almost 10 years ago. My career and life are so much different now than they used to be that it's almost hard to imagine that I had a “normal” job not too long ago. I spend a lot more time reflecting now than I used to, mostly because working online gives you the opportunity to think without interruption more often than not. Before I go on – I do want to say that I really enjoyed being a teacher. I've had readers email me that felt I was being a little too harsh on teaching. It's a great career – no doubt. But…it ended up not being right for me. A major part of my job was to drive around to the jr. high schools and teach percussion classes to the 6th graders that were coming up to the high school eventually. On one random day, I had an argument with another teacher (and I honestly don't remember what it was about or even who it was with) about something related to the 6th grade class. As I was driving back to the high school from the jr. high, I got so freaking stressed out about it that I actually felt physically ill. I'm sure a lot of you have had an experience like that at a job in the past. People who are close to me know that I HATE confrontation. It just seems useless to me in most situations. A stupid argument about something that probably didn't matter at all in the grande scheme of life had me sitting at a stop light feeling light headed. Unfortunately with a lot of fields in the arts, people have to choose whether they want to make a lot of money or enjoy their profession. While blogging probably isn't an “art”, it absolutely scratches the itch I have to be creative. It's also super scalable. If you can reach tens of thousands of people, you can probably make a lot of money. At some point it really just comes down to a numbers game, especially with affiliate products or courses you might offer on your site. As you can tell by the picture above, you don't really need a designated office space to make money. 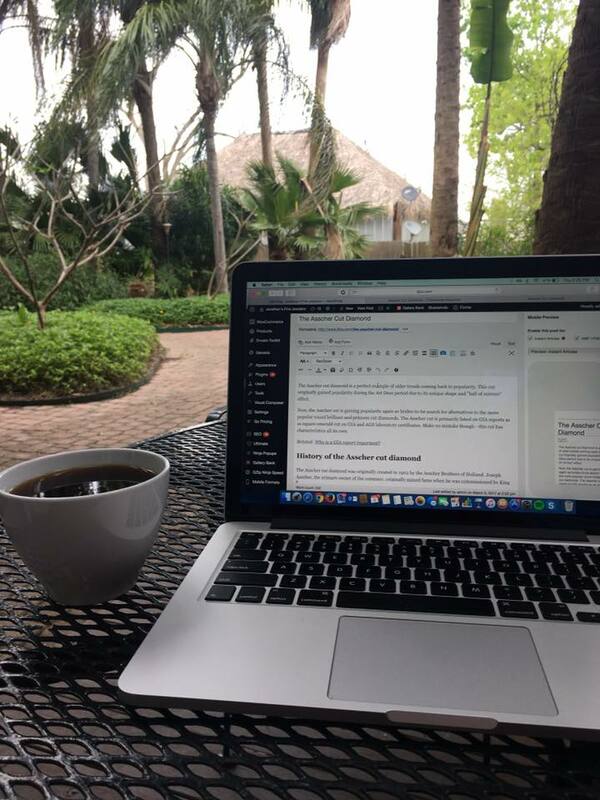 I tried to work from an office when I first started my online business, but I just found that it was way easier to write from cool coffee shops or even on the couch. Wifi and my laptop is basically all I need! And coffee. Lot of coffee. I know that using “linear” for working hours may seem a little weird, but that's the way I think about it now. Most people think that bloggers don't work at all or only a few hours a day, but I can tell you that it isn't the case. Now – you can definitely choose your hours and make time in the day for certain things, but I really have a low key constant stream of work now. I'll write some stuff, check emails, write, look at affiliate accounts, etc. and basically cycle through it all day. If I hit a creative road block, I'll shut the computer and chill for a little bit and come back to whatever I was working on later. I've meet cool people online, have the option to go to blogging conventions like FinCon (yes blogging conventions are a real thing), and have a job that makes people say: “whoa…that's freaking cool“. Work used to feel a lot more like a chore, but now it's something that I wake up and actually look forward to. I really hope all of you are able to find the job that makes you feel that way as well. This is where there is a little bit of a caveat. Blogging in itself isn't really stressful at all, but owning a business definitely is in the beginning. The cool thing about it is that most of your stress is something that you can control, whereas in a normal job it's probably coming from a boss or coworker that you can't do anything about. Once you get past the whole non-guaranteed income thing and learn how to actually run a business, the stressful parts tend to fade away. You don't HAVE to be trapped at a job you hate. I don't think everyone can become a blogger. It would be wildly irresponsible to preach something like that. However, I do think that the internet has made some pretty incredible things possible that our parents and grandparents couldn't have even imagined. If you have an idea for ANY kind of online business or blogging as a second income stream or potentially your future full-time gig, please give it a shot! It's at least worth finding out if it's something you would enjoy. I also want to say that blogging is definitely an art and you, sir, are an artist. Haha that’s kinda the point of the question! I think as long as it’s part of your life plan at some point, there is nothing wrong with other jobs that get you there along the way. Blogging can be as creative or non-creative as you want I’ve found. I could definitely make the topics a little more dry or straight-forward, but what’s the fun in that? Great article!! It gives me that push I need to start my own!! I do have a question for you: can you set up an online shop through a blog? Or would you use it to promote an Etsy shop? Thanks! Yes, you can! If you create a normal WordPress site like this one, you can add Etsy through plugins like “Etsy Shop” or “Etsy Importer”. This gives you WAY more control over the look of your store, and you can use the blog to promote the store as well. Sound like you have a lot more control over your life, which in my opinion, is the biggest key to happiness. I don’t know about point 5, and the “kinda” is definitely a must at the very least 😉 I’ve lived off running my own business, which was a website making money chiefly through advertising, and between everything from uptime and load time considerations, fear of Google algorithm changes to advertising rates dropping, I’m not sure I would say “less stress” is applicable. With a normal 9 to 5 there’s stress of an entirely different kind, but at the very least you know your pay check will arrive on time (at least that’s a privilege I’ve always enjoyed while having a full time job). I understand – but I am speaking from my own experience. I’m FAR less stressed than I was at my band directing job. You certainly have found your dream job! Your point that you don’t have to be trapped doing a job you hate is right on. This is one of the main reasons why I feel so passionately about getting out of debt and living on a budget. At first, sacrificing to win doesn’t sound like much fun. But when you realize the end result is more freedom, you’ll be a lot more motivated to stick to the plan. Ask yourself this, “If you didn’t have any payments in the world, would you still be working at your current job?” If you can answer, “YES!” then you’ve found your dream job! Oh I like that rule at the end! That picture with your laptop looks awesome! You have been a big motivation in our blogging journey. After switching from 6 different jobs after college I finally had that “moment” that I knew I needed something different. It happened when I realized I HATE when other people tell me what to do. I currently work at a place where my boss is one of my best friends, still can’t stand getting told what to do. I should have followed my entrepreneur spirit from the start when I was running an online business throughout high school and college. No regrets though I am in this exact spot in life right now for a reason. I had to go through everything I have to really find where I should be and be motivated to get there. I think the most enticing thing about blogging is the creative part, just like you mentioned. You can literally try anything you want! If it doesn’t work kill it and try something else. Making your own hours is a huge draw as well. 100% self employment 2017 is the goal. I am going to make sure that happens. Time to be my own boss once and for all. I was the same way with hating being told what to do. Big sign of an entrepreneur in my opinion. It’s like forcing a round peg in a square hole! Becoming financially independent was step one in starting a new life of freedom from a full time job. Once I’d calculated that my investment income was sufficient to pay all of my bills and living costs, I quit my job and haven’t looked back. Since then, I’ve started my own blog (a year old this month), started an online business, and have an freelance writing side hustle all of which keep me pretty busy but I’m not longer working to someone else’s schedule. It’s hard to describe how enlightening it is to be in this position, but as you know Bobby, it would be near on impossible to go back to a regular job again. I heartily recommend it to everyone. Man I’m jealous – having that investment income to cover your expenses would make this game SO much easier haha. I think I’m at a point to the site where it can be fairly consistent, but I have been putting so much money back into the company in the last month or so that it doesn’t feel like I’m bringing in nearly as much as I actually am. great job. Looking forward to spending more time here. Where did you go to music school and what instrument was your main instrument? Do you still play any instruments now that you’re done teaching band? I have a music Music performance degree but haven’t been in that line of work in many years. I am self-employed and have been financially successful and debt-free except for my mortgage. I am thinking about giving blogging a shot. Keep up the good work! Hey Joe! I went to University of Texas San Antonio, and I was a percussion major. I play one bagpipe band gig every year, and that’s it now haha. You should definitely give blogging a shot! Ha! I am from San Antonio and live in the Hill Country now after many years in the Northeast. MacArthur High School Alum here. Hey I work as a systems analyst in the financial sector. I just had a 3rd non-event based panic attack meaning my body simply said “dude if you don’t rest in going to put you down” (you can’t make this stuff up). I’ve got to switch it up. I run TheLegendaryCoffee.com. Do you think its viable to run a blog related to coffee and the idea of changing your career? I have Fortune 100 level experience and feel that I can relate to what a lot of people are going through in their trapped day jobs. Just curious if you know where I should start to begin monotizing or if I need to start producing content and slowly wait to monotize. If the content is good, then you can blog about basically anything. The more niche the better honestly – the internet has created an environment where you can create a community around almost anything if you put the work in and find the right people to read. It takes time to monetize, so I’d just focus on making the best content possible and really figuring out exactly who you are trying to reach. If you haven’t – take my free blogging course. It has a ton of info that will help you.